Elvis Almanzar came to Temple as a psychology major with dreams of one day owning his own private practice. With a semester’s worth of credits from AP classes under his belt, Almanzar said he decided instead of graduating early, he would tack on a Spanish minor with certificates of specialization in health and human services professions and Spanish and Latin American studies for business. In Fall 2011, he found a program that allowed him to showcase his education. Almanzar started tutoring for the organization Puentes de Salud after a professor’s recommendation. The tutoring program, Puentes Hacia el Futuro, which translates to “Bridges Towards the Future,” meets three times a week at the Southwark School in South Philadelphia. The program aids first-generation American students who grew up in Spanish-speaking households and are attending English-speaking schools. Its mission statement is simple: To help promote the well being of Philadelphia’s Latino community through medical care and educating future generations. Almanzar said what drew him to the program was his personal connection to the organization’s mission statement. As a first-generation American, he said he could relate to the hardships the students in the program are facing. This is a problem many Latino-American children face when they grow up in Spanish-speaking households and then are uprooted into English-speaking schools. 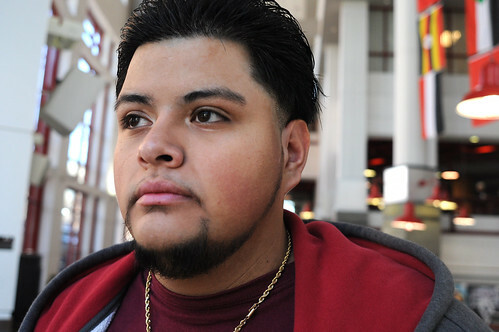 “Kids feel inferior to their classmates, they struggle twice as much,” Almanzar said. According to the organization’s website, the number of Latino immigrants has increased from approximately 6,220 in 2000 to an estimated 30,000 currently in South Philadelphia. Almanzar said that the program has grown tremendously, as well. “We went from tutoring 10 kids to now 35,” Almanzar said. The biggest challenge the program now faces is the shortage of tutors. To make up for the lack of assistance, Almanzar is in charge of all boys in the fourth and fifth grades. Almanzar said that teaching others has been a learning experience. Working with the children, Almanzar was able to explore working in a specific population—one he can personally connect to. A month into his tutoring efforts, Almanzar was presented with the first internship with Puentas Hacia el Futuro. He said his consistency and success in tutoring and mentoring the students, combined with his fluency in Spanish made him an asset to the program. Almanzar also meets with the students’ parents for regular progress reports and assists the coordinator. He added that he took the internship not for a job, but because of the love he has for the students. Almanzar will become the first person in his family to graduate from college in May. “This is only the beginning of my education, I still have a lot to learn,” Almanzar said. Jessica Lopez can be reached at jessica.lopez@temple.edu.